New superyacht tender builder Invictus has launched its first model, the 280GT by designer Christian Grande. The company, based in Borgia, Italy, collaborated with multi-award-winning yacht designer Christian Grande on the 8.9-metre superyacht tender, which features an eye-catching reverse bow. This bow shape extended the waterline length, allowing for increasing living spaces below decks. 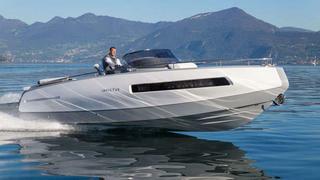 The boat should be capable of 38 knots maximum speed, powered by 320hp Volvo V8 sterndrive diesel engine. With the engine fitted, the 280GT comes in at 2200kg. Apart from the unusual bow, the 280GT is characterised by a relatively large bathing platform. The engine housing is covered by a sunpad that enlarges by rotating the rear backrest. A central L-shaped settee faces the steering area, the latter with a double ergonomic seat amidships. There is also a galley module here, complete with fridge and lockers. The bridge is protected by a wide sweep-around windscreen and equipped with the latest digital instrumentation including a video monitor and inclinometer. The bow zone offers further sunbathing space. The cabin below has a vee berth around a central table and a good-sized bathroom.